Maneuver your man to destroy the aliens before they complete a sectional tunnel from the bottom of the screen to the top. If a tunnel is completed, additional enemies appear. Destroy or “shove” tunnel sections off the screen. Destroy aliens before they complete a tunnel system that connects the top and bottom of the screen together. Destroy or shove blue tunnels or shove pink tunnels to rearrange them and prevent the aliens from completing their mission. Use a “smart bomb” to destroy all enemies, and your own agent if you’re not careful, in a large area. Earn additional bombs by destroying blue sections of tunnel. End the round by destroying a preset number of aliens. Your man begins each life in the center of the screen. At the top are blue tunnel “sections” and at the bottom are pink ones. Aliens start at the bottom of the screen in the pink sections. As they move through, they can build new sections in any direction. Blockers – These foes build the tunnels and they can exit the tunnel system or be forced out. If they exit the tunnels, they produce Expelers and quickly make their way to the bottom of the screen to re-enter the tunnels. This is the only time that they are vulnerable. Expelers – These enemies, produced by the Blockers, chase your agent around the screen and attempt to corner him. They travel at different speeds, generally moving faster as they get closer to your man. Anngrers – These cubed-shaped foes are invulnerable to your SWAT agent’s fire. Shooting this type of enemy will cause it to chase your man very quickly. They can be destroyed by using bombs, but a new Anngrer will be created in its place at the bottom of the screen. These enemies can travel in and out of the tunnel system wherever they choose. 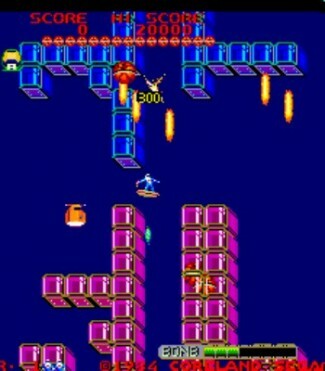 Sweepers – Along with additional enemy fire, these foes appear in pairs on the left and right sides of the tunnel along if the bottom and top portions of the screen are connected by one continuous tunnel. They will line up with each other on either side of your SWAT agent and fire at him. Sweepers require multiple shots to be destroyed. Your man, a futuristic SWAT agent, can shoot blue tunnel sections to destroy them. Pink tunnels can not be destroyed by your man, but may be “shoved” off the screen by your SWAT agent if he pushes against them and fires. Tunnel sections on the opposite side will whiz off the screen if unobstructed or rest against another tunnel section if one blocks it. Pink blocks which are no longer connected to the bottom turn blue and float toward the top. Your SWAT agent, who rides around the screen on a small hoverboard, begins his mission with a limited number of “bombs” which he can use to destroy all enemies in a large area, including the “indestructible” Anngrers. Additional bombs are earned for every 10 blue tunnel sections destroyed. The round ends when a predetermined number of Blockers are destroyed. Each subsequent round requires a greater number of Blockers to be destroyed to advance to the next round. Your agent loses a life if he is caught by an alien, hit by alien fire, or caught in the blast radius of his own bombs. Only one additional life, if set, can be awarded per game.